We make our products with the best possible ingredients. We never use gmo ingredients in any of our products and will continue into the future this way. From a small business standpoint, I feel this is over regulation and an exorbitant waste of funds. These funds can be used in better places, like supporting local farms that grow non-gmo crops. And continuing to develop the best products possible. 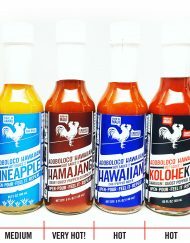 ABOUT ADOBOLOCO: Hot Sauce or a Hot Sauce Gift Set, for the Hot Sauce Purist. Hot Sauce flavors featuring each chili pepper. Born in Maui, Enjoyed Everywhere! THE HOT LIST || GET ON IT! First to be notified of small batch limited releases and important announcements.